The episode takes its most horrifying turn when Jamie and Claire discover a slave named Rufus (Jerome Holder) hanging by a hook through his torso. After receiving a lashing, Rufus had drawn the blood of his white overseer — a “crime” for which Rufus was to be executed. Claire insisted on saving Rufus, and ultimately performed surgery on Jocasta’s dining room table before having him moved to her and Jamie’s bed to recover. But the neighboring plantation owners demanded “justice” anyway: If Jamie didn’t hand Rufus over by midnight to the mob at Jocasta’s door, they threatened to punish the other slaves and burn River Run to the ground. Seeing no other option, Jamie suggests Claire aid Rufus the way she had his uncle Colum, with an assisted suicide: “If your oath is to do no harm, then isn’t it better to save his soul than to have those men tear it from his body?” Claire feeds Rufus a fatal cup of tea, holds his hand, and asks him to tell her about the sister he dreamed of seeing again. Once Rufus took his last breath, Jamie says a prayer for him, then carries his body outside — where the white mob drags him to a tree and hangs him. 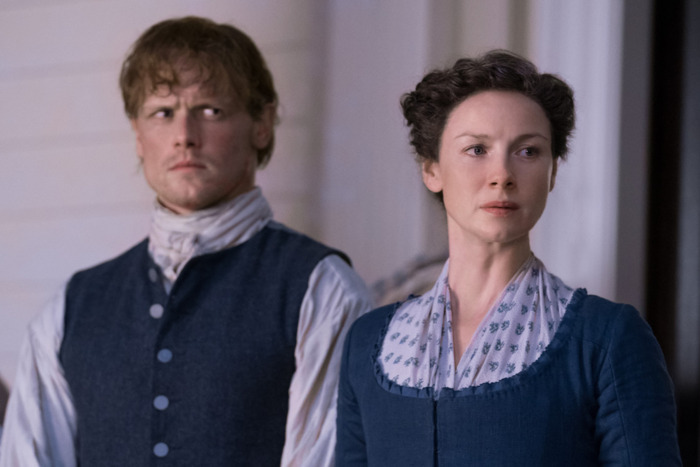 Ahead of Sunday’s episode, Caitriona Balfe talked with Vulture about shooting those gut-wrenching scenes, why the visit to River Run brings the Frasers even closer, and the one thing she’d change about the home we’ll see the couple build in the backcountry. What was the most challenging moment to film in “Do No Harm”? There were quite a few things that were very difficult. First of all, just being on that plantation setting and having our actors and our extras be in that position of playing slaves — it’s a horrible thing to even watch and be a part of as make believe, because unfortunately, it’s all too real in history. When Claire and Jamie give Rufus the tea, that was really tough. There was a lot of talk about those scenes, whether it should be this way or that way. What were the conversations surrounding that tea scene, specifically? Part of what is so tough about playing Claire is how she, a lot of the times, is so rational, but in this episode, she lets her emotions run riot and dictate. And the fact that in trying to help this one boy, she’s put his fellow slaves and his fellow workers in jeopardy. It’s watching Claire be so run by her emotions that she’s not able to think clearly. Those scenes with Rufus … for Claire, it was just to try to get him some kind of peace, and to, in some way, give him an escape from what is going to be ultimately his fate with the mob. We were wondering whether or not it’s the right thing to do to have somebody take that decision into their hands. Even though Claire is a doctor, is it better to give him this peaceful exit? We all struggle when we get scenes like that, finding the right way to do it.